Composed by Joachim Raff. Edited by Nicolas Di Paolo. This edition: softcover. Bisel Classics. Score. With Text Language: English / German. Opus 24. 22 pages. Published by Bisel Classics - Digital (BQ.979-0-50179-162-0). Valse Melancolique was composed in 1846, the year after he went to work for Frank Liszt and the beginning of a period which was to leave and indelible impression on the young composer from both the point of view of orbiting so close to such a stellar personality as Liszt and the influence on Raff's own compositions. 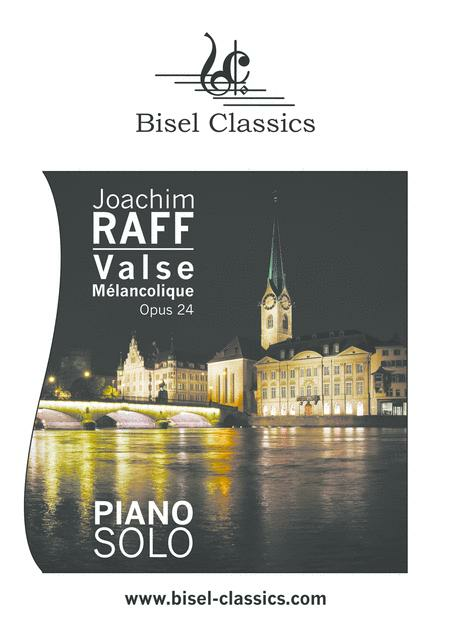 An interesting salon piece for players of intermediate ability and upwards, the Valse is ideally suited for study or for performance, in or out of the dance hall.